H&M's newest collection, A Tribute to Marimekko, uses the bright patterns from this Finnish company to create bold pieces including maxi dresses and long skirts. Do you dare to wear the vivid prints this summer? 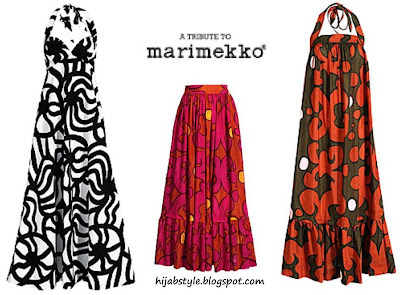 Read more about Marimekko here. I love that black dress. I have one like it, but not quite that cute. I also like that black dress...any suggestions as to what to wear under it? A long sleeved t-shirt just seems to 'under-dressed' for it? Thanks for posting these!! Aalya, I'd wear a light white jacket over it. H&M happen to have some of those in too! the one on the right is GORGEOUS. omgomgomgomg. Loved the skirt until i went into H&M yesterday and found out it didn't have any lining so quite see through... im still considering getting it and putting some lining under it myself... but not sure its worth the hassle.... love the dresses too btw they are so cute.